I first started visiting The Lost Gardens of Heligan as a student in the very early 1990s. By then the Tremayne family’s forgotten pleasure grounds had been rediscovered by their descendant, John Willis. 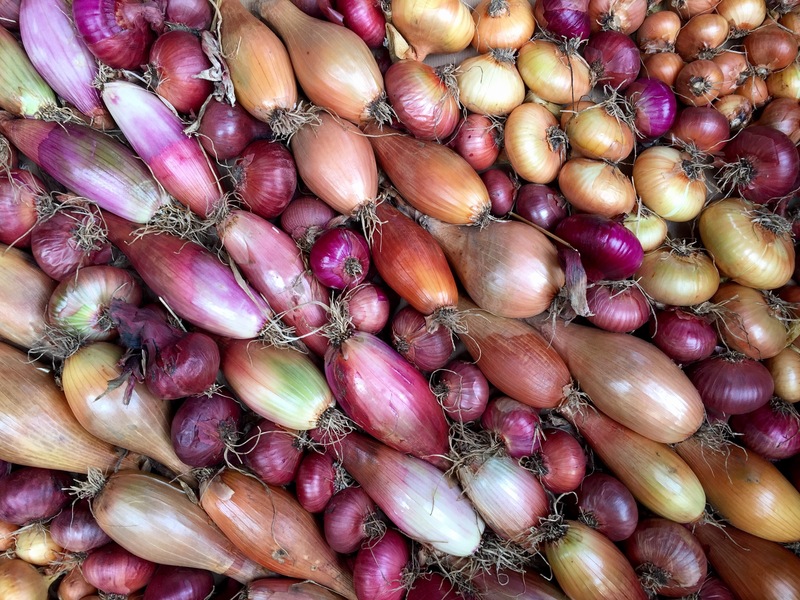 Thanks to Tim Smit, later of Eden Project fame, there was already an audacious plan to revive them. As the decade progressed, the gardens continued to reveal themselves like an onion, one layer after another, springing back to life as each suffocating blanket of debris was removed. Seventy years of rampant undergrowth had been peeled back from the upper portions of the garden to expose Flora’s Green, the vegetable and Italian gardens. Restoration of the oval Melon Yard was already well underway, but the steeply wooded ‘Jungle’ was still an impenetrable no-man’s land, asleep beneath a thick green coverlet. Piercing the undulating canopy of rhododendrons and laurels we could see handsome wellingtonias and hundreds of tree ferns waiting to be rescued from the rising tide of foliage. Fast forward twenty-five years and Heligan is now one of Cornwall’s foremost visitor attractions with all the attendant facilities: refreshments are home cooked and the shop sells a good range of locally sourced gifts, clothing and plants. 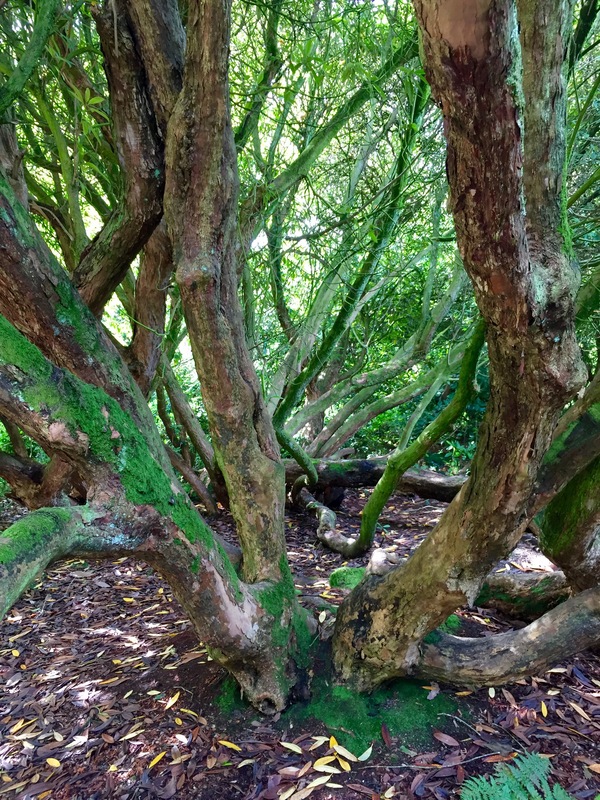 The garden has a very fine collection of trees and shrubs, many of which were planted in its pre-war heyday (nine of the thirteen gardening staff who served in The Great War were killed in action, kick-starting Heligan’s decline). Returning yesterday, it was interesting to note that some of the areas first reclaimed from nature in 1991 are now undergoing a second renovation. Heligan’s restoration has been so sensitive that it’s easy to imagine that the estate’s original gardeners have just retired for the day leaving us to marvel at their work. 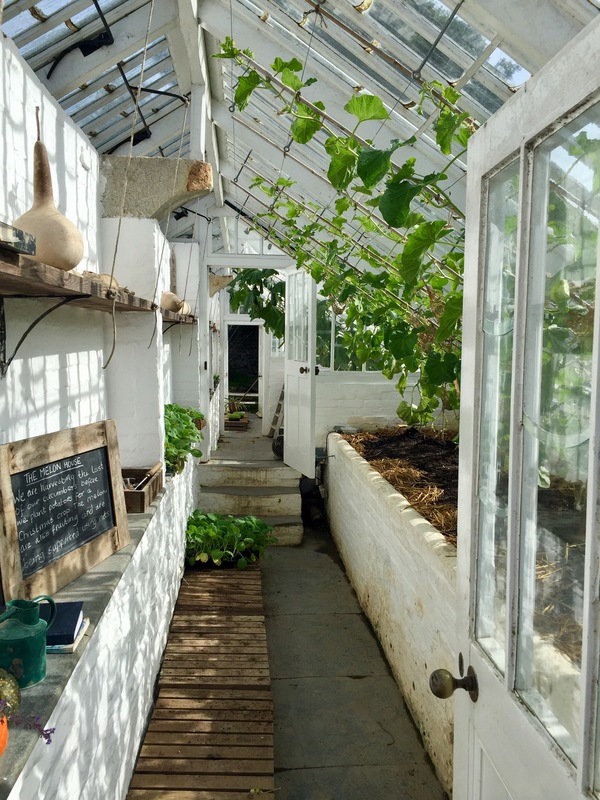 The greenhouses are my favourite haunts, reminding me of the mornings when I used to help my grandpa pollinate the peaches on the country estate where he worked pre-retirement. That era is over, but a poignant sense of how it once was endures at Heligan. 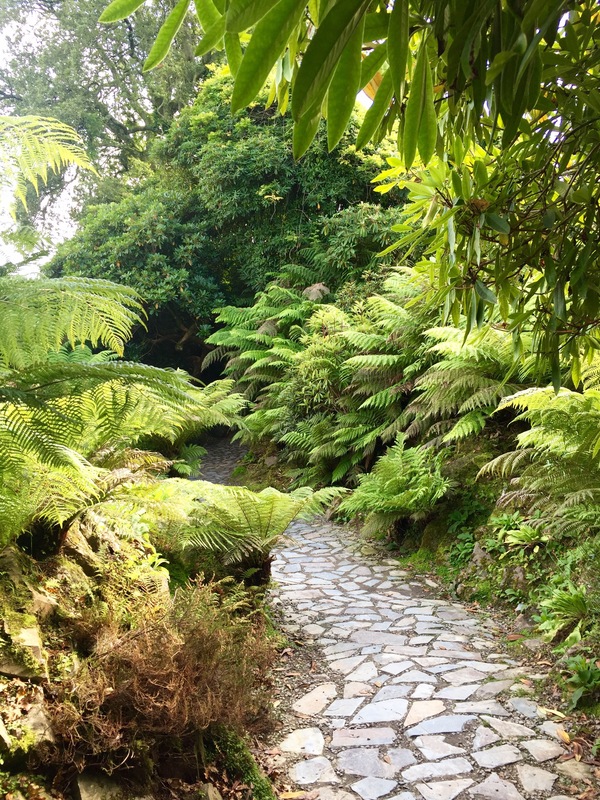 Following extensive clearance and replanting The Jungle provides an experience as close to a rainforest as its possible to get outdoors in the UK. 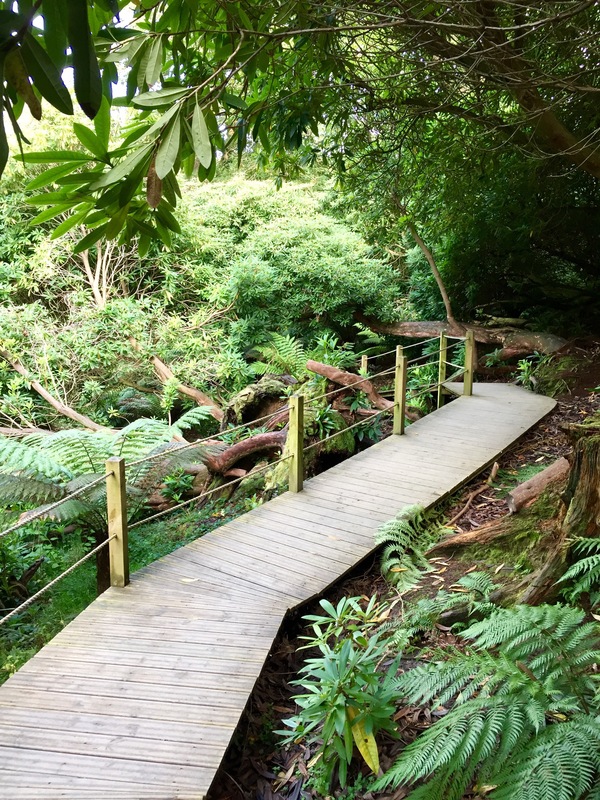 Mossy pathways and non-slip boardwalks guide visitors though groves of tree fern (Dicksonia antarctica) and soaring bamboo. I was particularly impressed by a huge bank planted with gingers, bananas and cannas. The area given over to lipstick-pink Canna x ehemanii was larger than my entire garden. 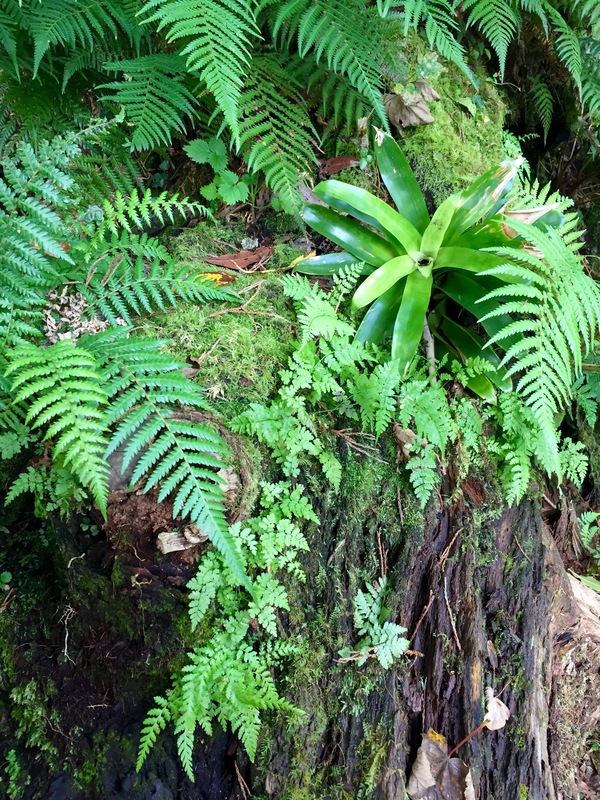 In The Jungle, bromeliads sprout from among the native ferns which colonise any tree that has not withstood the test of time. Having started experimentation with airplants outside at The Watch House, I am keen to move on to bromeliads next summer. The Jungle provided a masterclass in how to situate these epiphytic plants naturally, although the conditions I can provide for them are the polar opposite. Not many visitors make it as far as The Jungle, so one can get a real feel for the Tremayne’s extraordinary private Eden by venturing here. Where else in the UK would you find bromeliads growing wild? Heligan is not one of those immaculate gardens with colour-coordinated herbaceous borders and intricate bedding schemes. Very few Cornish gardens rely on such overt vanity for their greatness, preferring instead to exploit their unique microclimates for the cultivation of exotic species from the Himalayas, New Zealand and South Africa. 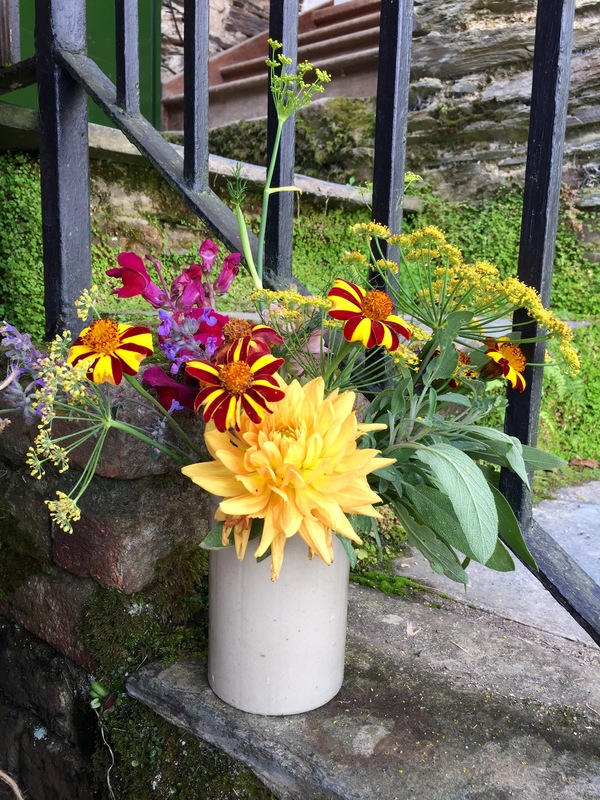 Living in one of Britain’s driest spots I am supremely envious of the West Country’s mild, damp climate which permits almost anything to grow, anywhere. 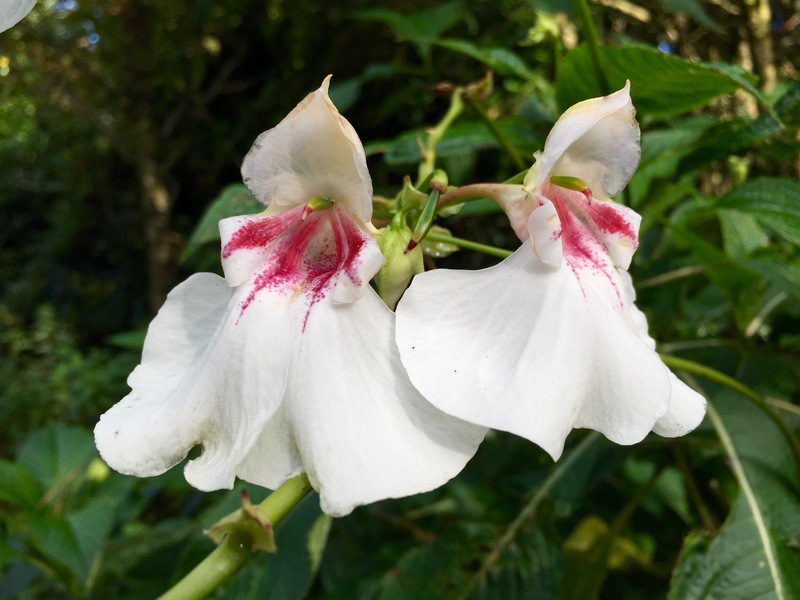 From Central Africa comes the wonderful Impatiens tinctoria, a Busy Lizzie producing stems two metres tall from dahlia-sized tubers. The huge, night-scented flowers look like orchids, or blood-stained hankies, depending on how generous you are feeling. Productive gardens have always been front and centre of project Heligan. Clustered north of the big house (which was sold off and divided into flats in the 1970s), they are neatly planted with rows of vegetables and trained fruit trees. Few of us have plots that allow for ranks of Swiss chard and leeks sixty feet long, but they make for an impressive sight. 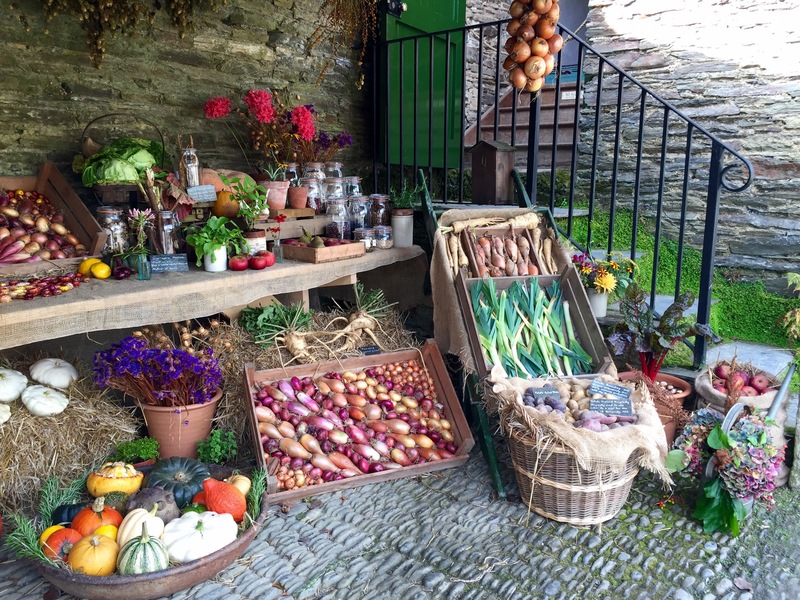 Over the next fortnight the gardens are hosting a special Heligan Harvest event which includes a programme of talks, demonstrations and workshops. There will be special Feast Nights on Saturday 30th September and Saturday 7th October, promising fabulous food cooked by guest chefs. If you’re in the area, I’d recommend you book yourself a table or on to one of the workshops or tours. 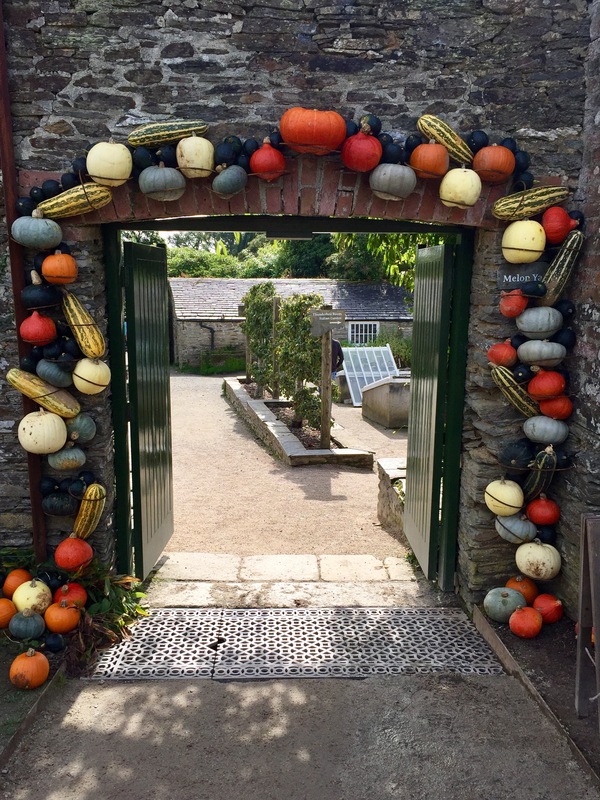 Meanwhile the gardens are looking splendid, decked out with marrows, pumpkins and gourds in celebration of Heligan’s impressive harvest. As someone who’s perpetually in denial that summer is over, I found a trip to Heligan just the right way to ease myself gently into autumn. TFG. 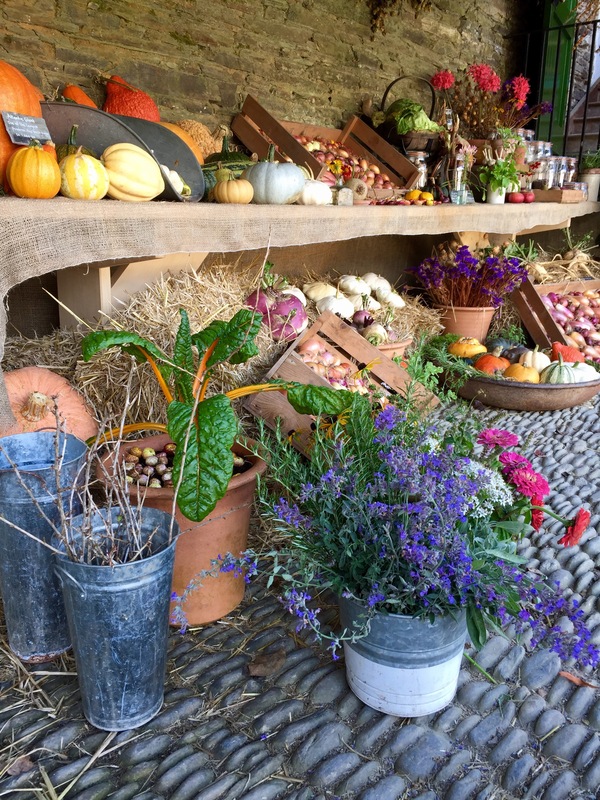 Heligan Harvest runs Saturday 23rd September – Sunday 8th October. Click here for more details. 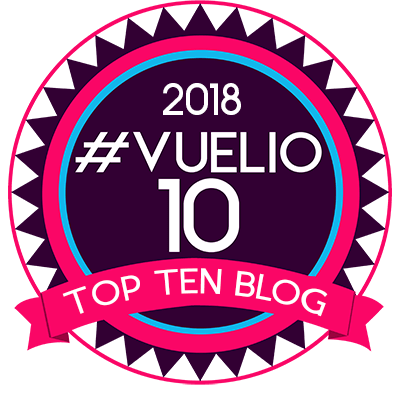 Hello Dan.I am new to your blog and finding it very interesting indeed.Your layout is excellent!. I was lucky enough to have some Peach pollination training from an older Head gardener too.The peach house and Vinery were very like the Heligan Melon house in your picture.I must visit Heligan – and the Eden project sometime.At least your pictures and write up have given me a glimpse. 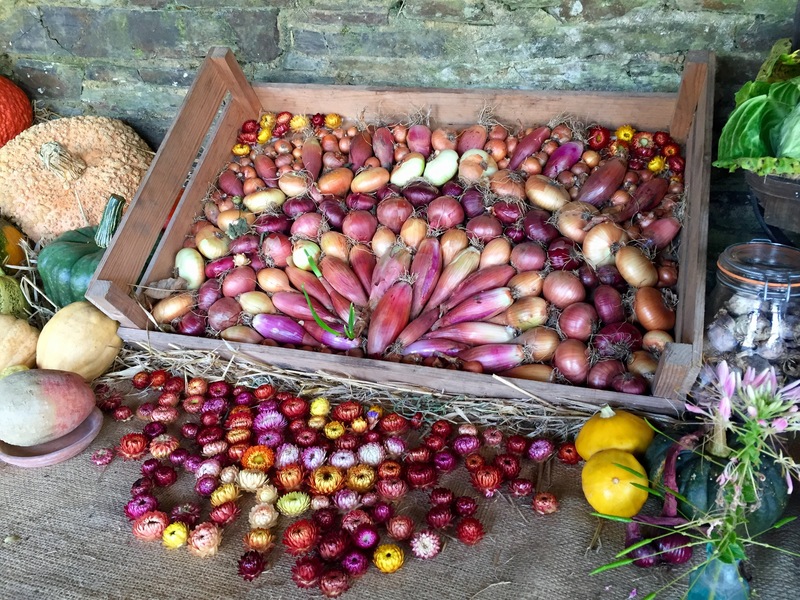 There’s someone with a keen eye for display at Heligan, the arrangements of produce are stunning! They are lovely aren’t they? Extremely photogenic too, which is lucky for me! A visit to Heligan was on our bucket list and we were so lucky to be able to visit when we went to the UK. The only day available was windy, cold and very wet. We were amongst a handful of visitors that day. So we happily spent the day in this most magical of places. We ended our day covered in mud, wet to the bone and overcome by the beauty of it all. 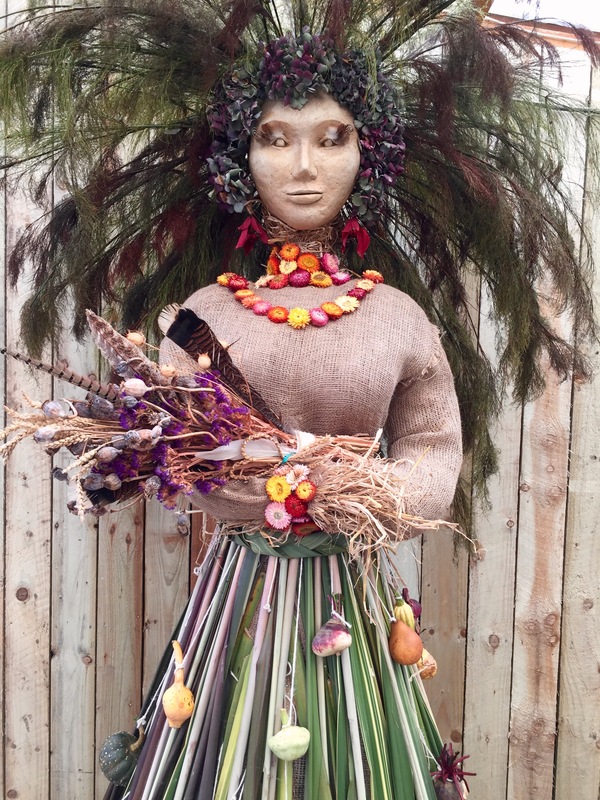 Thank you for your blog and for representing your nation of glorious gardens and gardeners. I’m sorry you were so unlucky with the weather on your visit to Heligan. I’m afraid it’s often the way down here in the South West that ‘mild’ does not translate into ‘sunny’ or ‘dry’. But if the weather were any different areas like the Jungle could not exist. A little piece of Heaven …. And that potting shed floor! Fab! Thankyou for the tour Dan. Oh yes, lovely isn’t it? There’s a little cobble path in the Mediterranean biome at the Eden Project laid just like this. It’s so textural and pleasing to look at. Perhaps less appealing to walk on in heels or bare feet. I loved the Jungle 😊 and the food on the restaurant is amazing. Wish we lived closer. A wonderful blog about one of our favourite gardens, just 1 1/2 hours away and we have ‘Locals’ season tickets. No excuse for not having somewhere to go with our neighbour’s little black spaniel as dogs are welcome. Mr TT and I first visited in the summer of 1993, the year after the gardens first opened to the public. Visitor facilities then were very limited, some areas of the Pleasure Gardens were open and work was progressing over the wider estate. Like you, we have watched developments over the years. A must for me on every trip is a colourful visit to the Pencalenick Greenhouse, the mass of Pelargoniums in flower at all seasons of the year is stunning. One thing I would like to add about our ‘mild and damp climate’ down here, please spare a thought for us during the days and days of wind and rain that we get from the Atlantic, the precipitation can be relentless at times! Darn, the Pencalenick greenhouse is the one thing I missed! Rather unkindly, there was a saying in my Cornish family that someone who wasn’t quite the full ticket was ‘down Pencalenick making wicket baskets’! Not very PC nowadays but that’s all I can think of when we pass the turning for Pencalenick. I don’t miss the West Country rain. Wednesday was enough of a reminder of how wet it can get. My walking boots still aren’t dry!